We absolutely love Mexico as a gay holiday destination. Places like Puerto Vallarta and Mexico City have a huge gay scene and you can't go wrong with Mexican food. It's a paradise for diving fans and also has some of the best beaches. We personally favour the beaches on the Caribbean side along the Riviera Maya, a 93 miles stretch of Caribbean coastline in Mexico's Northeastern Yucatán Peninsula. The Riviera Maya is also the perfect base to visit ancient Mayan sites and to do some world class diving. 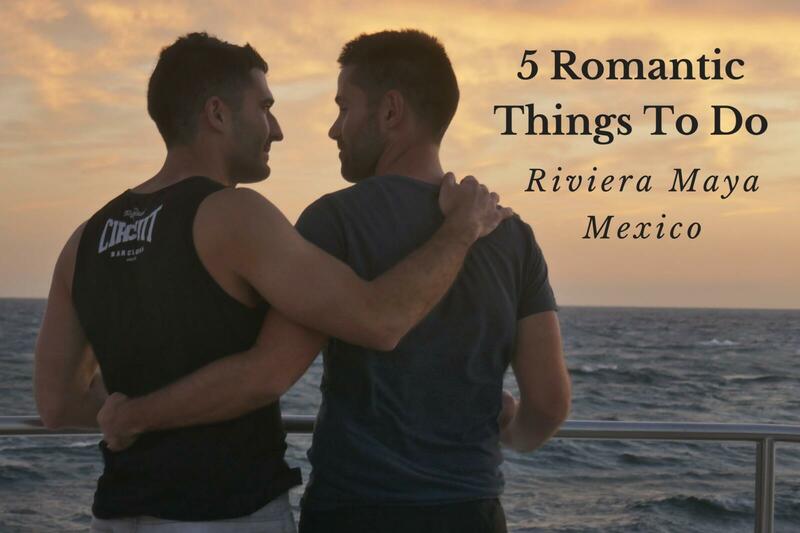 This is our 5 favourite romantic things to do in the Riviera Maya, which we recommend to all gay couples. The Riviera Maya has some of the most luxurious hotels and resorts in Mexico. You can find some of the best bargains here for both Riviera Maya Resorts and hotels. There are also a handful of adult only gay friendly hotels such as the Royal Hideaway Playacar and the Adonis Tulum Riviera Maya Gay Resort & Spa. Most are located right on the beach and near one of the main transport hubs in the region. Hotels in the region are a mix of all inclusive resorts, romantic villas and boutique hotels. Playa del Carmen is one of our favourite beach destinations. It was originally a small fishing town, which grew popular because of its long stretch of white powder sandy beach. The beach actually runs the entire length of the city and it's very easy to find you're own little private spot. Even better, you can get some super affordable massages here for around $30 USD for 1 hour session. We also love the long pedestrian walkway in Playa del Carmen called La Quinta Avenida or Fifth Avenue. It is lined with hundreds of boutique shops, bars and restaurants. As far as romantic things to do in the Riviera Maya go, a day trip to Playa del Carmen was one of our favourites. After scuba diving in the Komodo National Park in Indonesia, we had some pretty high expectations. Luckily for us, the Riviera Maya is home to the second largest reef system in the world, offering some of the best dive sites. The Mesoamerican Barrier Reef extends over 600 miles from Isla Contoy at the Northern tip of the Yucatan Peninsula all the way to the Bay Islands in Honduras. It contains more than 66 species of stony corals and over 500 species of fish, as well as sea turtles, manatees, dolphins and whale sharks. Some of the best dive spots include the Manchones Reef, Cancun's Underwater Museum, and the C58 Shipwreck. Tulum was one of the last cities the Maya inhabited, which served as a major gateway for connecting the Yucatan Peninsula and the Gulf of Mexico with the Mayan peoples of Honduras and modern day Central America. It was initially built as a fortress and unlike most other Mayan sites, it is located right on the coast. If you're visiting the Riviera Maya, we think you should definitely schedule a day trip to the Tulum National Park. It's not only an excellent way to get a deeper understanding of this ancient civilisation, but the views across the Caribbean from the Castillo clifftop are just stunning. We love our romantic cruises, in particular our liveaboard yacht in Indonesia and our luxury gay cruise in the Galapagos Islands. The Riviera Maya is the perfect spot to charter a sunset cruise and enjoy the tropical surroundings over a romantic dinner for a special occasion. You cannot beat this as the ultimate way to impress your other half. We recommend asking your Riviera Maya resort for recommendations for the best sunset dinner cruises near to where you'll be based. For more romantic inspiration, read about Playa del Carmen restaurants.